In Serie A, the highest goalscorer of the season is awarded the "Capocannoniere", a title that was bestowed on both Mauro Icardi and Ciro Immobile last season. Icardi scored 29 goals in 34 games for Inter Milan, while Immobile scored 29 goals from 33 games for Lazio. This season, with the introduction of Cristiano Ronaldo in the colours of Juventus, the race to the Serie A Golden Boot was bound to generate a lot more attention. The record for the most goals in a Serie A season has been unbroken for almost 90 years! In the 1928-29 season, Torino's Gino Rossetti scored 36 goals, a feat that was matched by Gonzalo Higuain in the 2015-16 season. But with the arrival of Ronaldo, one has to wonder whether that record will be intact come the end of the season. As such, here are the top 5 contenders for the Serie A Golden Boot at the start of December 2018. The Belgian scored his first goal of the season in the 3-2 win against AC Milan in the second game of the league, coming off the bench in the 63rd minute and scoring the winner in the 80th. He failed to find the back of the net in the next 4 games, a span where he completed the full 90 minutes just once. Mertens next scored Napoli's only goal in the 3-1 loss at the hands of Juventus. He also found the back of the net once against both Roma and Udinese, before scoring a fantastic hat-trick against Empoli at the start of November. As of now, that has been the last time he has scored in Serie A. Last season, the Belgian scored 22 goals from 49 games in all competitions. 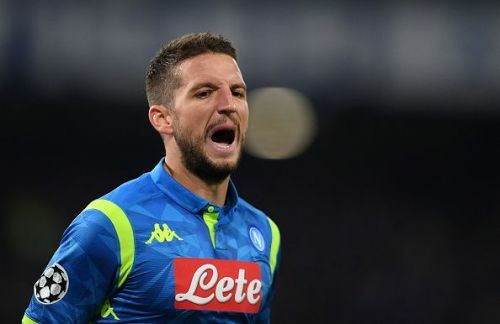 Mertens has 7 goals and 4 assists from 14 games in the Serie A this season, and has scored 10 goals from 19 games in all competitions for Napoli. He has registered 29 shots in the league, with 18 of those on target. At the start of December, the Belgian is 5th among the top contenders for the Serie A Golden Boot.